Photo courtesy of Maria Baranova. 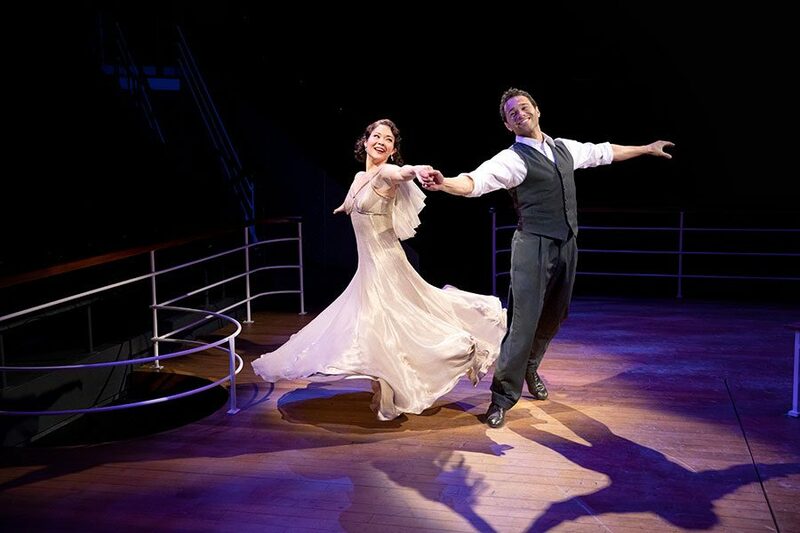 Lisa Helmi Johanson (Hope Harcourt) and Corbin Bleu (Billy Crocker) share a dance in "Anything Goes." Cole Porter’s classic “Anything Goes” is a blast in Molly Smith’s production at the Arena Stage. It embodies Porter’s original spirit and classic musical stylings as it tells the comical story of love, celebrities, fame and secrets. Leading man and “High School Musical” star Corbin Bleu is a triple-threat as Billy Crocker. Aboard the S.S. American on a trip from New York to London, Crocker leads the audience through a whirlwind romance. He impulsively stows away on the ship in an attempt to win the heart of his debutante love, Hope Harcourt (Lisa Helmi Johanson), after learning of her engagement to millionaire Lord Evelyn Oakleigh (Jimmy Ray Bennett), a Brit that just cannot get American slang right. By doing so, Crocker also risks his Wall Street job as his boss, Elisha J. Whitney (Thomas Adrian Simpson), believes Crocker is in New York to sell stocks. Crocker finds himself in various hijinks involving public enemy #13, gangster Moonface Martin (Stephen DeRosa), and evangelist-turned-nightclub singer Reno Sweeney (Soara-Joye Ross) and her quartet of angels (DeMoya Watson Brown, Lizz Picini, Kristyn Pope, Andrea Weinzierl). On board is also Moonface’s promiscuous lady friend, Erma (Maria Rizzo), wooing all of the ship’s sailors. Harcourt’s mother Evangeline Harcourt (Lisa Tejero) strikes up a romance with Whitney while her pooch Cheeky (Olly) is nowhere to be found. Luke and John, “Christian converts,” also join the journey as they engage in gambling and drinking. The last song in Act I deservedly garnered a standing ovation as Reno took center stage singing the iconic “Anything Goes.” The ensemble tap danced their way into intermission and the heart of the audience. One surprise show stealer was Bennett as Lord Oakleigh when he performed “The Gypsy in Me.” The performance revealed depth in his character and added him to the list of actors to watch out for. Crocker and Harcourt’s romance is slightly overshadowed by the chaos in the other explored subplots. However, by Act II, the depth and difficulty of Harcourt’s choice is nailed in her solo, “Goodbye, Little Dream, Goodbye.” The duo’s love story is wrapped up quite nicely in a sequence of jail escaping and wedding crashing. In sum, the show is a whirlwind of fun. Each scene seamlessly incorporates Ken MacDonald’s set. The actors themselves wheel in bars and dinner tables as they sing songs. DeRosa as Moonface even pokes fun at the railings and chairs that seem to disappear every other minute. MacDonald makes use of a rising platform popping out of the floor to showcase cabins and a brig, as well as lift Reno into the sky as she belts out a note. Musical director and conductor Paul Sportelli’s visible head also added a touch of comedy during the most outrageous scenes. Anything Goes at the Arena Stage is a perfect night at the theatre. It is clever, witty, and smoothly sails through its wacky plot. The show seamlessly blends together foot tapping musical numbers, burlesque, slapstick comedy and serious love stories. The dialogue and the characterization of certain, once offensive characters, has been altered to reflect the times and makes the production much more valuable. Smith casted a wonderful ensemble of talented artists that also reflects the reality of America. The show is a wonderful medley of the original novel by Guy Bolton, P.G.Wodehouse, Howard Lindsay and Russel Crouse, the revised version by Timothy Crouse and John Weidman, Cole Porter’s best work, as well as Smith’s own vision, to form a sensational 1 hour and 45 minutes celebrating the idea that yes, anything goes. Photo courtesy of Shane Querubin. 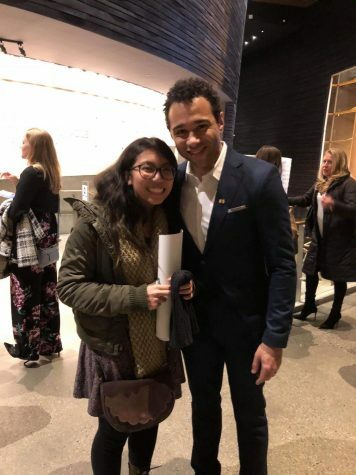 Tide reporter Shane Querubin snaps a picture with “Anything Goes” star Corbin Bleu during the post-show reception. The Fichandler Stage is quite different from the auditorium in Richard Montgomery High School. The four sides surrounding the stage brings the audience close to the action and leaves no one straining their neck to see. There are only eight rows on each side, so it is a relatively small theater, but it is great and very immersive. However, the seats are small in width and could pose some problems with people that are bigger than I or those carrying lots of things. The ushers were attentive and quite helpful, one even snapped a picture for me. The gift shop has lots of memorabilia for reasonable prices (I got a poster for five dollars). Arena Stage is also quite accessible by Metro with one transfer between the red and green line. Once you get off Waterfront station, there is a very big Safeway across it. There is a mochi bar inside if you are interested. Tickets for Anything Goes are $50-125 subject to change and based on availability, plus applicable fees. These may be purchased online at arenastage.org or by phone at 202-488-3300. Arena Stage also offers a Pay Your Age program that allows those under 30 years old to purchase tickets that are priced by their age. Proof of age for each member of the party will be required at time of pick-up. Fees are not included in ticket prices. However, children under the age of 5 are not permitted in the theater.